London's population has soared by more than half a million in a decade, figures have shown. 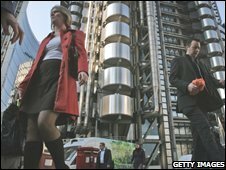 The City of London has Britain's fastest growth rate at 40%, according to Halifax, which analysed figures from the Office for National Statistics. Westminster's population has grown by 29% since 1997, Kensington and Chelsea by 26% and Camden by 25%. The biggest factor contributing to the population growth was people moving to the UK from abroad, Halifax said. An increase in births over the past decade, and fewer deaths, also boosted the UK population. Greater London's population grew by 542,000 to 7.56 million between 1997 and 2007 - an increase of 8%, according to the figures. This exceeded the 5% overall growth in the UK population, which stands at 60.98 million. London areas experienced the greatest increase, but North Kesteven in Lincolnshire, East Northamptonshire and Banbridge in Northern Ireland also saw rises of more than 20%. Halifax economist Nitesh Patel said: "Some of the fastest growing areas are starting from a small base, such as the City of London, which still only has a population of 8,000." He added: "There is a demand for people to live more centrally, perhaps for employment reasons, and there is still scope for development in big inner city areas. We are also seeing this trend in places like Leeds and Manchester." Westminster City Council and London Councils said the Office for National Statistics figures did not reveal the full extent of population growth. "London's population is growing at an even faster rate than these figures suggest because official data has failed to properly account for the complexities of migration and population churn," London Councils chairman Merrick Cockell said. A Westminster City Council spokeswoman added: "The statistics leave out a massive 'hidden' population and mean local authorities are constantly short-changed by government as they still provide vital services to these people but receive no government funding for them." The government plans to work with local councils to improve migration statistics, Mr Cockell added. A total of 44 local authorities have seen population fall since 1997, with 10 of these in the North East, 10 in the North West and 12 in Scotland, the Office for National Statistics figures show. Belfast saw the biggest population drop, falling by 7%, while Dundee City, Inverclyde and the Western Isles all saw falls of 6% and Liverpool saw a fall of 5%. Mr Patel said it was uncertain whether the current economic downturn would have any effect on the UK's general population trends.